Description: Ultimate hydration: Formulated for the driest, most active hands, this ultra rich Organic Argan hand salve is an intensive blend of bioactive, natural and organic ingredients together.. 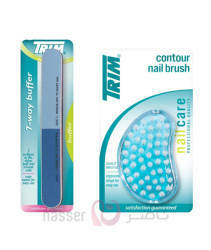 DESCRIPTION : Protective Nail Glue with a brush provides an ultra-strong bond in 4 seconds. Glue can be used to apply press-on nails. .. DESCRIPTION : Protective Nail Glue provides an ultra-strong bond in 4 seconds. Glue can be used to apply press-on nails. .. DESCRIPTION : Acetone formula for quick, clean and effective removal of nail polish. Contains Vitamin E and moisturisers to encourage healthy nails. 20 pads in a box. Easily and quic.. Description: A premium quality nailbrush made from beautiful dark rosewood with a traditional design. It features a row of stiff angled bristles along the top for cleaning under the nails with .. Description: Quality emery boards to shape and smooth nails. ..
Quality emery boards to shape and smooth nails. .. Description: complete set of tools to shape, file and polish nails 5 different attachments to shape, smooth and buff nails and keep cuticles neat and clean under.. Description: TEAL NAIL BRUSH/PUMICE STONE 2 uses in one tool soft bristle easily cleans toenails pumice stone softens rough callused skin ..
precision crafted for gentle shaping 2 surfaces to shape and smooth nails long lasting surface .. Description: Quality steel design for long lasting performance and durability .. Description: Produces wonderful results. Fine nails. .. Description: Precision ground cutting edges provide clean even cut> Enlarged opening for cutting thick toenails. Quality steel for long lasting performance. Triple cut nail for shaping and s..